Actors and their publicity agents need vivid imaginations. Yet, having come across more unverifiable stories about Brian Donlevy over the years than there are Starbucks cafes in Seattle, I’m always leery of most tales attached to the actor. One myth has it that the stocky, tight-lipped actor was born Waldo Bruce (some accounts say Brian) Donlevy on February 9, 1901 in Portadown, County Armagh, Ireland (now Portadown, Craigavon District, Northern Ireland) the son of a whiskey distiller.” Well, think again. He was christened Waldo (poor kid), but he was actually born in Ohio, and grew up in the same small town as Fred MacMurray, in tiny Beaver Dam, Wisconsin, (was there something in the water?). According to director Wellman’s memoirs, Donlevy took his role to heart and managed to alienate his cast mates and the crew with his autocratic behavior on their isolated Arizona set in the desert. As with most of his previous and many of his future roles, he usually died at the end of the movie (In Old Chicago, Destry Rides Again and Brigham Young, among others). And his dastardly characters usually deserved it. Though he was persistently typed as a bad guy, the actor managed to make his malefactors interesting enough to be understandable, if not always sympathetic. In reality, it’s possible that the journeyman actor, who’d knocked around Hollywood and Broadway for more years than he wanted to remember, may have found the well written role in the big budget movie Beau Geste to be a bit overwhelming and inspiring. An arrogant cockiness and brusqueness were often the primary requirements of his many previous roles, which had also included an occasional B movie lead role thrown into his busy but repetitive Hollywood career in the ’30s & ’40s. Yet in private life, there were those who enjoyed working with him repeatedly, among them his fellow actors at Paramount during the ’40s, when better roles were coming his way. Privately, he had a fondness for poetry, was fascinated by gold mining, and doted on his daughter Judy, by the second of his three wives. In a few films, among them his very effective turn in Wake Island (1942) (sometimes cited as the first war film to premiere after America’s entrance into the war), American Romance (1945) and two of the films showing tonight, he also projected a believable, regular guy who could grow into a thoughtful man. Underneath the alternately stoic, sometimes bluff, hearty manner, there was, as critic David Thomson points out, a “toy tiger” air to some of his posturing, which lent his roles a measure of determined vulnerability as well as de rigueur hardness. 24th on TCM in which Donlevy was given a chance to play a more nuanced character than he would ever play again. Maybe the director saw something in Donlevy‘s sometimes hurt acting demeanor that appealed to him–or maybe he just got a look at the actor’s outlandishly colorful bio, and had to meet him! As part of TCM’s celebration of politics on film this month during this presidential election year, The Great McGinty (1940) is being broadcast at 10pm EDT. Based on Sturges‘ delightful, funny and observant script, it tells the story of a Depression era bum on a soup line who becomes so efficient at voting repeatedly and fradulently (for a nominal fee) at various locations for the Tammany-like machine’s candidate, that he catches the eye of an appreciative if slightly wary ward heeler (William Demarest) and his delighted boss, played with brio and exuberance by Akim Tamiroff. Growing out of Sturges‘ observations of politics and tales that he’d heard of ward pols in Chicago; the film was a labor of love for the director, literally. One of the qualities that I like most in this movie is that, unlike some of Sturges‘ later, more confident work, such as The Miracle of Morgan’s Creek (in which Donlevy makes an amusing bit as McGinty again), Sturges restrains his madcap tendencies, and allows the humor and the tenderness in the story to unfold without his kicking events into high gear. Hoping to to prove his mettle as a director after a decade of phenomenal success as a screenwriter, Sturges did the film for Paramount without pay, happy to have the opportunity he craved at last. The movie received very little initial publicity from Paramount when it debuted in August of 1940, but the opportunity allowed Donlevy to break out of his memorable string of bad guys. Ironically, in this celebration of the American way of corruption, McGinty starts off as one more guy who’d be a fool to bypass a free lunch; but when exposed to the tenderness that the refined Muriel Angelus brings into his life via a politically arranged marriage to Mr. Big’s widowed secretary, (who also comes with 2 endearing kids), he gradually becomes dangerously reflective. Eventually the political pawns fall in love with one another, though the sentiment in McGinty’s new-found awareness is restrained and more touching, since it does little for his character’s status or bank book. Donlevy plays a pretty hapless cynic who’s just trying to get by, but who is touching and funny when he discovers what love and a conscience feels like–somewhat to his chagrin. McGinty’s naïveté is reflected in the boorish suits he buys as soon as he has a little money and it is shown in his realization that his growing power in the political machine has an impact on others. One of the qualities of Donlevy‘s performance in this role that is most engaging is that he is, with a few exceptions, among the quietest characters on screen, always watching the unreal pageant that is going on around him in the political circus peopled by Sturges’ collection of outrageous types. The actor almost broke out of the villainous ghetto with this wonderful turn in the raucously sharp and happily vulgar Sturges‘ film, but he soon went back to playing stalwart military types, occasional professional men, and out and out rats after that apparently brief moment in the spotlight. Donlevy‘s role in the film that follows McGinty this evening has him playing another political player as the thuggish Paul Madvig, this time in Dashiell Hammett’s The Glass Key (1942) directed by Stuart Heisler, (on at 11:30PM EDT), which was a remake of a 1935 version that had starred George Raft. Intended by the impressed studio insiders as a quick follow-up to what looked like a winning initial pairing of Veronica Lake, (who’s a bit too passively & aggressively sultry here for me), and the breakout star Alan Ladd in This Gun For Hire (1942), the movie tells the convoluted tale of backroom alliances and betrayals among those engaged in a high stakes political intrigue in a Midwestern town. As with many of Hammett‘s stories, the characters often seem more vivid than the actual plot, which, frankly, is often beside the point; except that it is a prime example of the writer’s disdain for anyone in politics. The film’s grit is largely provided by the menacing if rather engagingly coarse politico played by Donlevy who backs a “reform candidate” played by Moroni Olsen, (an actor I always find suspicious). Ladd, who was an excellent actor in his compelling quiet way, played Donlevy‘s perceptive right hand man, a fixer whose smooth manner and familiarity with the mechanics of the political machine makes him invaluable. The film is also enhanced by the presence of William Bendix, the excellent character actor whose career thrived after his work in this film and his critically hailed work in Hitchcock’s Lifeboat. In one of his most memorable bad guy roles he brings some vivid menace to the movie. Some of his most frightening work as a thug comes when Bendix gives the star, Alan Ladd, an exceptionally violent beating (for a ’40s film). Interestingly, Bendix and Ladd would become close friends and appeared in several films together while both were under contract at Paramount, such as the memorable The Blue Dahlia, Two Years Before the Mast and Calcutta. Despite Donlevy‘s top billing in this movie, he seems overshadowed by the glamorous pair of Ladd-Lake and Bendix‘s memorable brute. Donlevy’s brash character has a few good moments, especially in the scene when he tries on some new socks just after throwing Joseph Calleia out of his office. Yet Madvig (Donlevy) is ultimately a bull in a china shop, over his head in the dark noirish waters of this tale, and blind to many of the consequences of his impulsive actions. While any broadcast of The Glass Key is such a rare event that I hope it is an indication that some of the other films mentioned above from this exceptionally interesting period at Paramount might finally be distributed more widely on cable and on dvd. Brian Donlevy would continue to work almost until his death in 1971, appearing in many other excellent films, such as the classic noirs, Kiss of Death (1947) and The Big Combo (1955), in which he played a deaf mobster so memorably, the British sci-fi movies featuring the character of Prof. Bernard Quatermass, the iconic if cheesy The Fly movies, and some films too dreadful to mention. One movie that I hope is someday discovered by more viewers is the unusual underrated film noir, Impact (1949). This independently produced little movie features Donlevy, and two actresses of that period who truly deserve to be rediscovered: Ella Raines, and Helen Walker. The real heart of the film, it seems to me, is carried by the sturdy frame of Brian Donlevy. Donlevy. As someone who enjoyed his work in many films, it was a delightful surprise to discover his performance in this movie. He is by turns a lovesick husband, a tough, perceptive San Francisco businessman, and a lost soul, nursing bitterness, sorrow and anger as well as rediscovering the pastoral world that he stumbles into in the bucolically Capraesque Larkspur, Idaho. Many of his most powerful moments come when he realizes what has befallen him, at one point staring off into space, and crying what look like searingly painful tears. In another scene, he allows himself to relax just long enough to drink in the beauty around him in the town–including Ella Raines, who is clearly falling in love with him. As he tries to reassert his guard with Raines after he finds that he is probably facing prison time, the abruptness of this break with her clearly hurts him as much as her. One particularly memorable scene comes when Donlevy forcefully tells Ella Raines during a jail visit that he wants to believe in the things that she believes, (such as justice & love), even though his experience has taught him to reject it. It’s almost as though he’s praying for faith, even though he’s an atheist. Suffice it to say that the director, Arthur Lubin, whose most distinguished work during his career, other than the okay remake of Phantom of the Opera with Claude Rains, and pointing the camera toward Abbott and Costello in several pics, discovered what I’d describe as Donlevy‘s fierce diffidence and found a way to translate all that pent up emotion into this story. This actor’s abilities only seemed to come to the surface occasionally in his long career. Perhaps others appreciate Brian Donlevy too–especially after seeing him in some of these better films? Curtis, James, Between Flops: A Biography of Preston Sturges, iUniverse, Inc., 2000. Henry, Marilyn, Henry, Ron Desourdis, The Films of Alan Ladd, Virgin Publishing, 1990. According to published reports Donlevy was drunk the entire time the two Quatermass films were made! Recently, a couple of movie buffs pals and myself admitted to each other our crush on Donlevy. We’re certain it has more to do with “Impact” rather than “Beau Geste”. Now, just what do you find suspicious about Moroni Olsen? I find his authoritarian voice usually of great comfort. Well, if true, the story about a lack of sobriety on the set of the Quatermass movies is hardly surprising. It wasn’t at all unusual for actors of Donlevy‘s generation to be heavy drinkers, (remember, he came of age in the Roaring ’20s). It’s not unusual for British movie sets to have liquor readily available either, which might have made the temptation irresistible. Despite this, there are many sci-fi aficionados who cherish the The Quatermass Experiment (1955) and Quatermass II: Enemy from Space (1957), in which Donlevy appears to be his often grouchy but astutely observant self. Frankly, after four decades as an actor, I wonder if Brian Donlevy might have been quite chagrined to find himself still having to seek out any work he could, though that was the nature of the business, especially after the studio system collapsed. If I were he, I might have imbibed as much saki as possible before facing the camera a decade later in the Japanese production, Gammera the Invincible (1966) as well. At least on that movie he had Albert Dekker for company, as well as the fire-breathing Godzilla knock-off. How nice to know that someone else likes this actor’s work! As to the latent dubiousness of Moroni Olsen for me, I think that his sonorous voice and the certainty of the numerous authority figures that he portrayed set me a bit on edge. I guess I thought that he was trying to lull me into some false security or something. I think he’s a good actor, btw–I just wouldn’t turn my back on him for long! Donlevy was a great pal to Diana Barrymore when they made a film together. He also married Lillian Lugosi, ex-wife of Bela, in 1966. I like The Great McGinty. I have the video, The Glass Key, which is entertaining. Dane Clark has a small part in it. I believe he gets shot. One of my favorites among his movies is Jesse James. Tyrone Power stars, Henry Fonda and Randolph Scott co-star, and character actors like J. Edward Bromberg, Donald Meek and Donlevy have a field day. Brian Donlevy was an essential presence who lent weight and truth to dozens of movies from the studio era. I wonder if his relative shortness made him a more likely choice as a counterweight to Alan Ladd? I”m sure that’s one of the reasons that tiny Veronica Lake was teamed with Ladd. Btw, Akira Kurosawa’s “Yojimbo”, the Japanese Samurai film, was reportedly inspired by Alan Ladd’s quietly authoritative performance in “The Glass Key” as a key for the character of Toshiro Mifune’s wandering warrior. I wonder if Ladd knew of the far reaching effect of his work? “Real women viewers” who like Brian Donlevy’s work in The Great McGinty, Hangmen Also Die and the Quatermass Xperiment are more numerous than is acknowledged. He might seem an odd choice since he was usually a bad guy or a second lead, but there was something about Brian. Good profile of a neglected actor. I have always been a fan of Brian’s and love his work in Big Combo, Glass Key, Quatermas Xperiment and Quatermass 2 best of all. Nice post on an actor who rarely gets any attention. Sadly, Donlevy stars in one of the worst movies ever made — THE FAT SPY with Jayne Mansfield. It is a ridiculous concoction that is a sad commentary on the tail end of both of the stars’ careers. It is a spoof of the Frankie and Annette beach movies, which were ridiculous enough without spoofing. FAT SPY is one of those movies that is so bad that its’ 70-minute running time seems like 4 hours. I always felt bad that these gifted performers felt driven by circumstance to be in this movie. They deserved better. Super article as usual. I’m a fan of Impact, too. I saw a few minutes of it again recently on some cable station, but it was too far along to record. Hope to see it again in its entirety some day. A correction: William Bendix may have deserved an Oscar nomination for Lifeboat, but he didn’t get one. His only nomination came for his supporting role opposite Donlevy in Wake Island. Thanks for the clarification on William Bendix‘s Oscar nomination. I’ve corrected that error and I apologize for my wishful thinking regarding Lifeboat. To be truthful, I think that Bendix may have given his very best “average Joe in uniform” characterization in Guadalcanal Diary (1943), not the broader character sketch that did in Wake Island, as the “civilian-minded” guy who re-enlists in solidarity with his besieged buddies (particularly Robert Preston). Btw, I found a decent dvd transfer of Impact (1949) cheaply in a Dollar Store recently, so perhaps you can scarf it up as a bargain. I’m happy to report that the depressing sounding The Fat Spy is one movie I’ve gladly missed among Brian Donlevy‘s late career “choices”. Moira, another grade A profile. 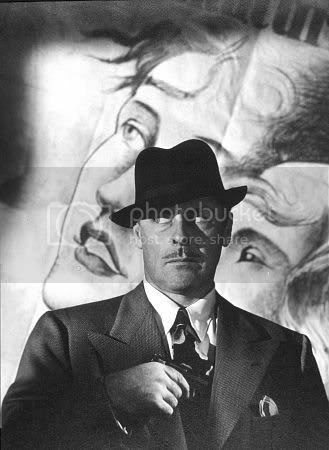 Always enjoyed watching Brian Donlevy whether he was good or evil. Recently saw him in “The Great McGinty” (couldn’t believe the plaid suit) and “Kiss of Death”. I recall his usual bad guy role in “In Old Chicago” which I watched many times. Of course he excelled in “Beau Geste”. I too feel that William Bendix should have at least gotten an Oscar nomination for “Lifeboat”. I like Donlevy in most of his gangster movies, as well as Westerns. One of his more interesting roles was as the former head of the mob in “The Big Combo”. His character’s deafness is key to his unique downfall. Wish someone would write more about Joseph Lewis’ movies.